A flood defence, nicknamed the Chertsey Sausage, has inspired a butcher to create his own version to raise money to protect the town. The flood defence was a sausage-shaped aquadam, which was installed to protect homes in the flood-hit town last month. 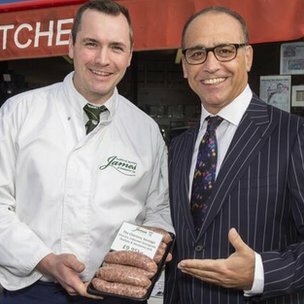 The sausage was the brainchild of James Lally, the owner of James of Shepperton Butchers. Mr Lally's creation was the winner of a competition to help raise money for future flood relief. The competition, judged by entrepreneur Theo Paphitis, was run in partnership with Get Surrey and the Surrey Herald & News. Now the recipe will be used at 120 butchers around the country to help raise money for two charities involved with flood relief. "If people are supporting us and buying the sausage we will keep selling them, and the more we sell the more we can raise," Mr Lally said. The original aquadam, nicknamed the Chertsey Sausage by locals, was an inflatable tube 600m (0.3 miles) long filled with water. It was dismantled on 18 February after flood alerts were downgraded. A portion of the profit from the sausages will go to the National Flooding Forum and the Community Foundation for Surrey.